ROHATYN - ROGATIN - ROGATYN. TOWN INFORMATION PAGE. 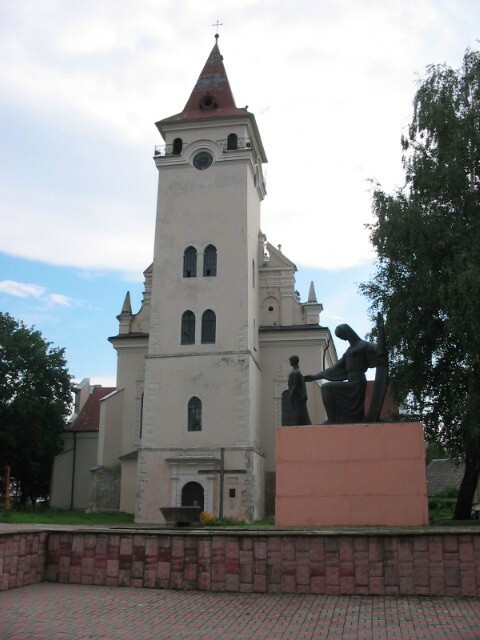 Rohatyn is small town in northern part of Ivano-Frankivsk region in Western Ukraine. With population about 12.000 people. 1772, 1920 - 1939. Before 1349 it was part of great Kyivan Rus and Ukrainian/Ruthenian Galician when Kyivan Rus collapsed. It was major deffence settlement on the approaches to the principality's capital of Halych (Galic/Halicz), some kilometers to the south of Rohatyn. In 1349 Galician principality was occupied by Polish king Kasimierz and incorporated into Polish kingdom. Forceful Polonization and Latinization of local Ruthenian population started. Many Polish, German (later from 16 th cen. also Jewish) colonists settled in all Galician Ruthenian towns and villages. In 1772 Poland was divided and Rohatyn got to Austria. Forceful Germanization started. 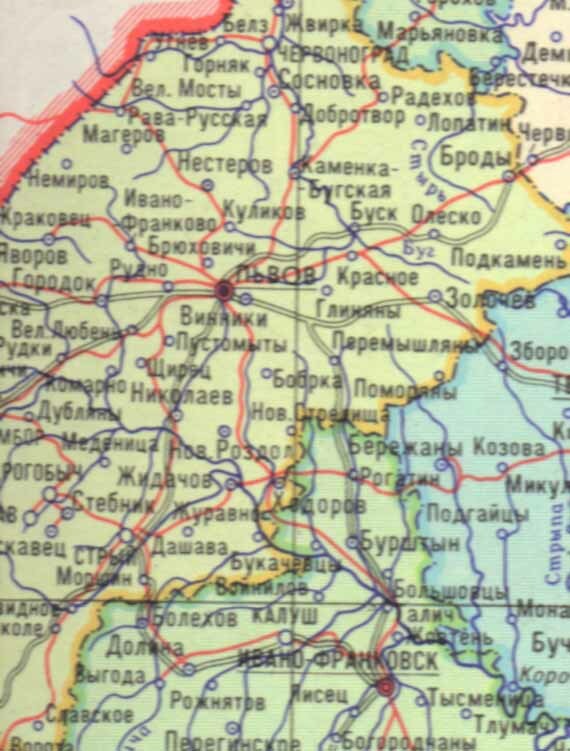 With the collapse of Austria, Rohatyn was also part of Western Ukrainian National Republic (so called ZUNR in Ukrainian) in 1918/19, which was again occupied by Poland after heavy battles between ZUNR's Ukrainian Galician Army (UGA in short) and Polish armies supported by France and Antanta states. Poland won the war and Western Ukrainian lands went under Polish control again, but only for 20 years when in 1939, they were taken by Soviet troops, to be reunited with Ukraine (Ukrainian Soviet Socialist Republic within the Soviet Union). Forceful collectivizations, persecutions and deportations of local Rohatyn population to Siberia started. 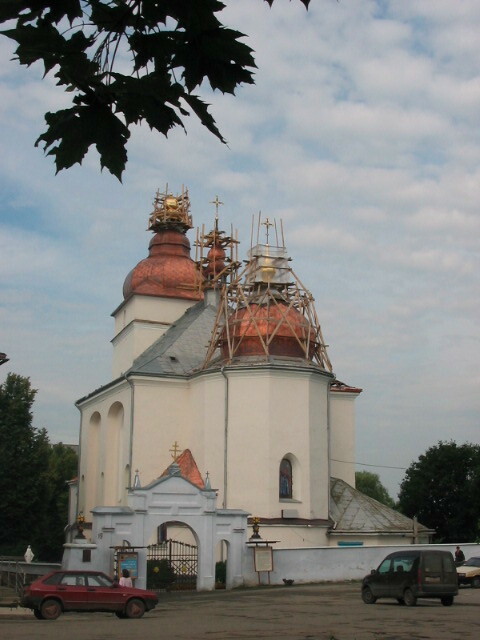 Local Ukrainian Greek Catholic Church became forbidden to be replaced by Moscow Orthodox Church instead. In 1991 Soviet Union and its regime system collapsed and Ukraine with Rohatyn became independent. Rohatyn is in the heart Ukrainian (Ruthenian) historic province of Halychyna (Galicia/Galizien) in picturesque and hilly geographic zone of Opillia, one of the most beautiful corners of Ukraine. 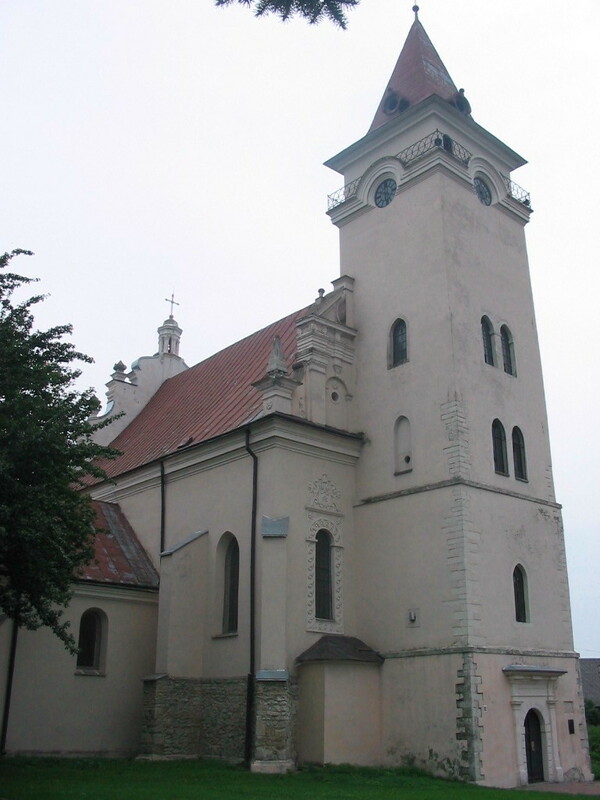 Before the Soviet and Nazi occupation Rohatyn's population was mainly Polish and Jewish (Ukrainians were minority in towns in Galicia before 1939) as in all other Galician towns. There were 3,002 Jews in Rohatyn in 1939! in 1931Ukrainians lived in villages and constituated the bulk of population in Eastern part of Austrain Galizien (Galicia). After Nazi's Jewish Holocaust, Rohatyn and Galician Jewish ethnic element stopped to exist and was wiped out, the remaining part emmigrated and escaped from Soviet regime to Israel, Poland and the West. Rohatyn and Galician Poles were resettled in 1945 from Western Ukraine to new Western Poland (former German lands around Wroclaw and Bydgoszcz). 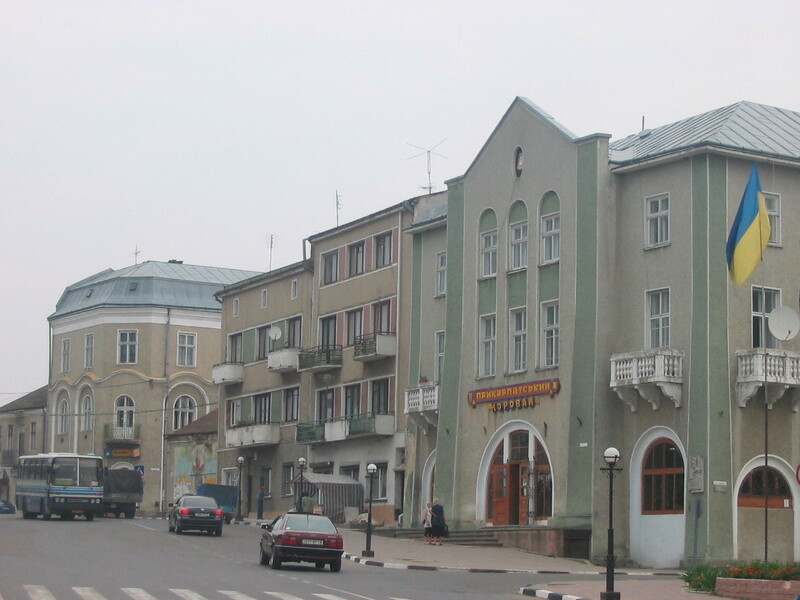 Nowadays Galician towns and villages are exclusively Ukrainian with very a few assimilated and Ukrainian speaking Poles, Jews and Russians, living in towns only. Many of these lost their Polish/Russian/Jewish identity and you can see it only by last name if this person's ancestors' were Russian, Jewish or Polish. German and Stanislawow in Polish, Stanislav/Stanislaviv in Ukrainian). Ab. 80 km to Lviv to the north. It is only 30 km west from Berezhany. See my site on my hometown Berezhany. Rohatyn district borders with Berezhany district on the west. Pukiv. I hope you will enjoy my Rohatyn page...Click also on the images to enlarge. presume. Also, "opole" was an administrative land unit of early Poles and Slavs. spiral of villages in the valleys. Above: One of Rohatyn Greek Catholic Churches and the main downtown street. 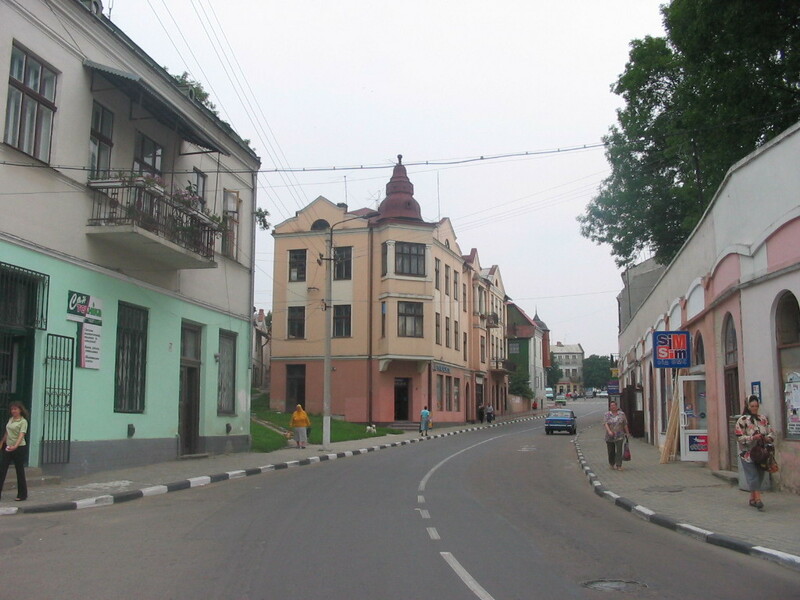 Rohatyn is modern Ukrainian official name, sometimes transliterated as Rogatyn also. not mistaken. Rohatyn has about 10.000 inabitants, now exclusively local Ukrainians. small road), nearby many new private houses are being built. remember the name of that city. Rotten. One legeds tells that earlier local people used to extract gold from the rivers. 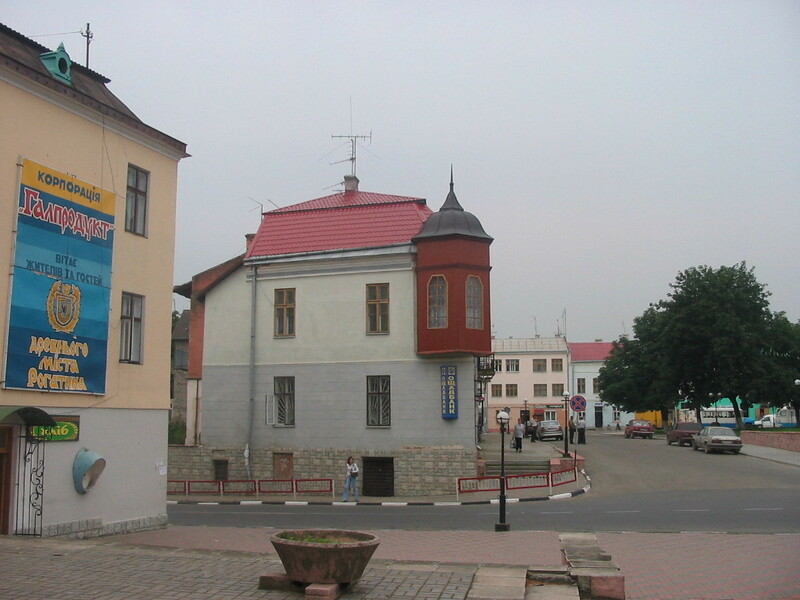 Most of Rohatyn historical venues are within a wlak, as town as rather small and compact. 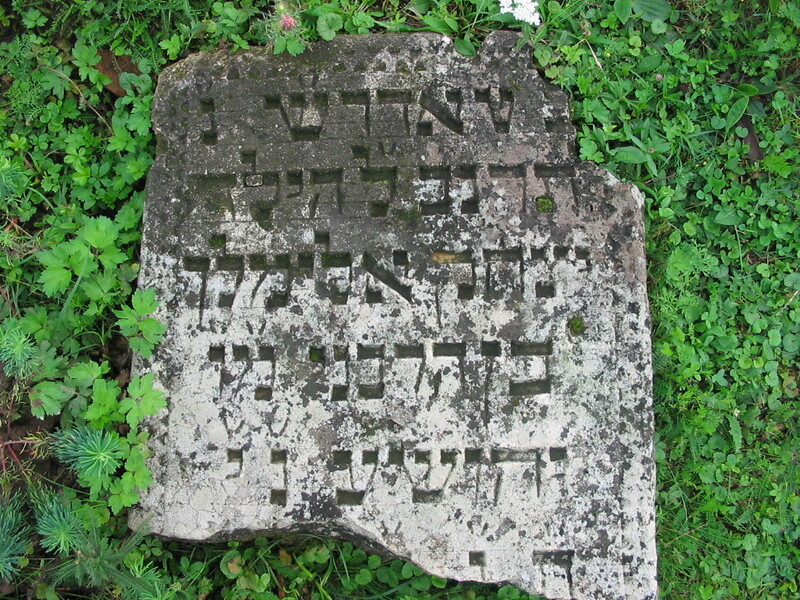 Old Jewish Cemetery is located on a hill next to an old wooden church of St Nicholas. 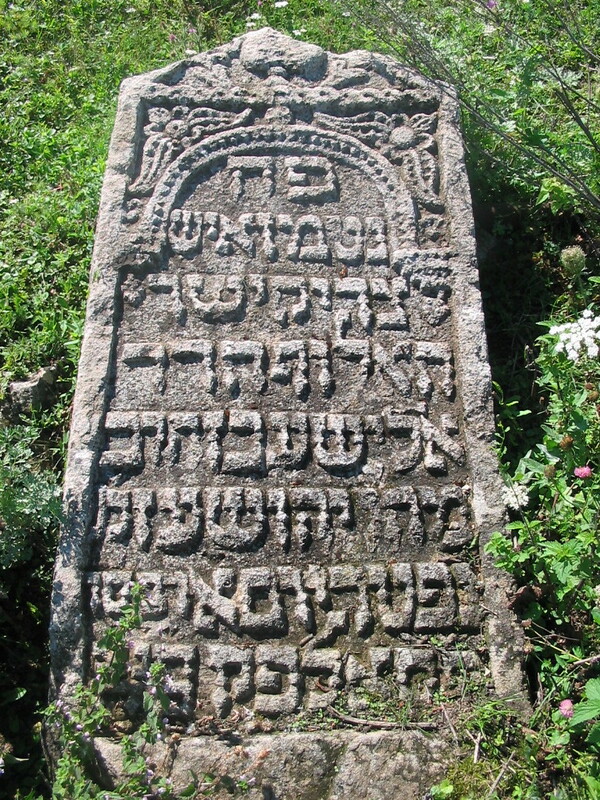 It is one of the oldest Jewish cemeteries in Ukraine. Only a dozen of damaged gravestones got preserved. Cemetery is fenced and two new memorial monuments were installed in the last years. I visited the Rohatyn Jewish cemetery several times and photographed all the remaining gravestones and inscriptions last summer. 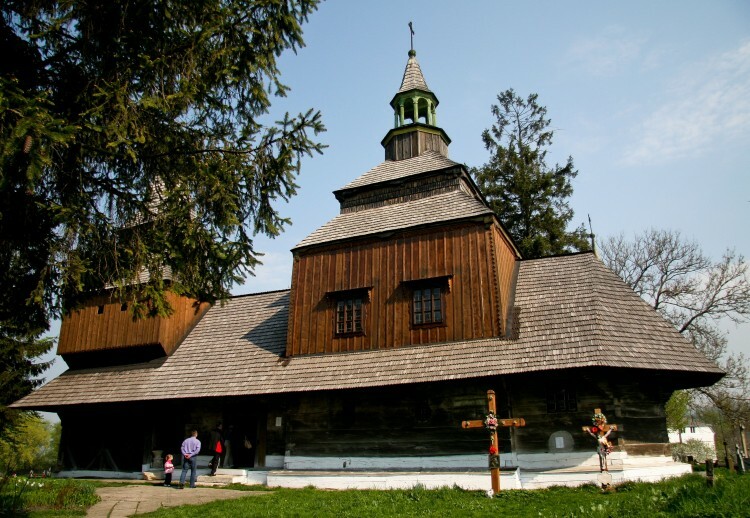 The wooden church is located on the other side of the road from Jewish cemetery and is a Greek-Catholic/Uniate one (Ukrainian name: Mykolayivs´ka tserkva i dzvinytsia). the rare types of Galician people´s school of wooden architecture. 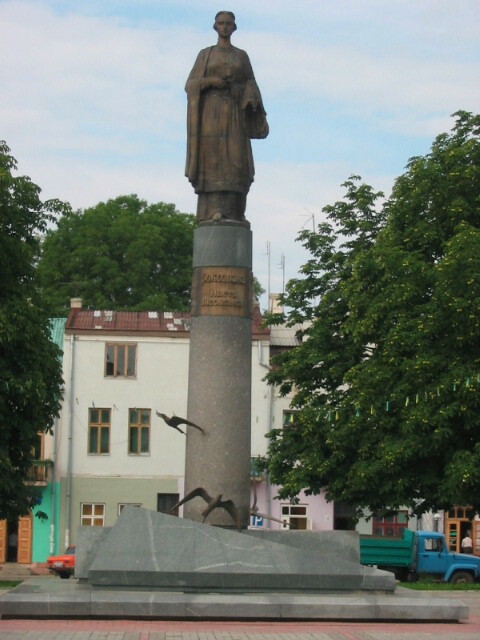 conducted in 1969 - 1973.
and monument to Polish writer Adam Mickiewict next to it. cupola. The monument is solved in renaissance and barocc forms. camps in Siberia. 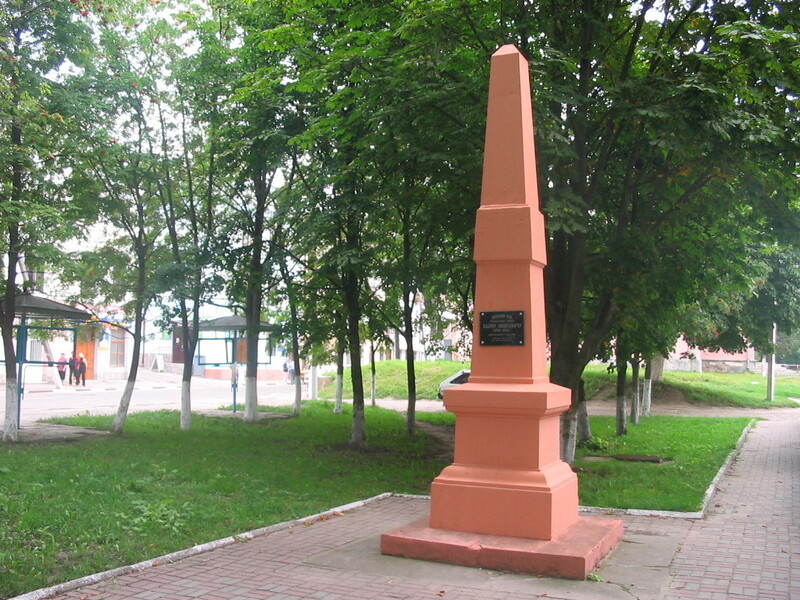 It is located at the central square of Rohatyn. 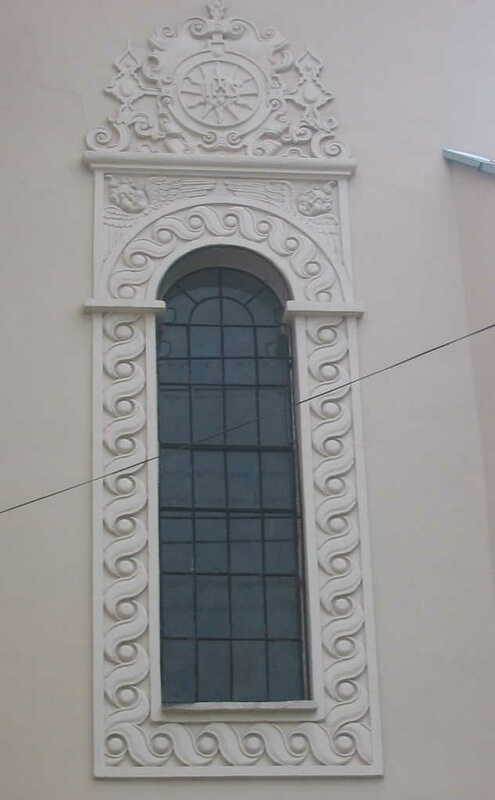 Originally, it was Ukrainian Uniate (Greek Catholic) church but nowadays a museum. Reorganized into museum with the Soviet occupation after 1939.
bellfry of framework construction completed with tent-like cupola. cholera epidemic, which hit the army and Rohatyn at those times. because of her. Many local Rohatyn products, street and so on, are named after her. and Turkish I think) can tell you more about her. Sulieman's Mosque in Istanbul was built by Sulieman for Roksolana. Above: At the central suqre of Rohatyn. Photos taken by me in summer, 2004.
that place until today. You can see its picture at Urman Information Page online. 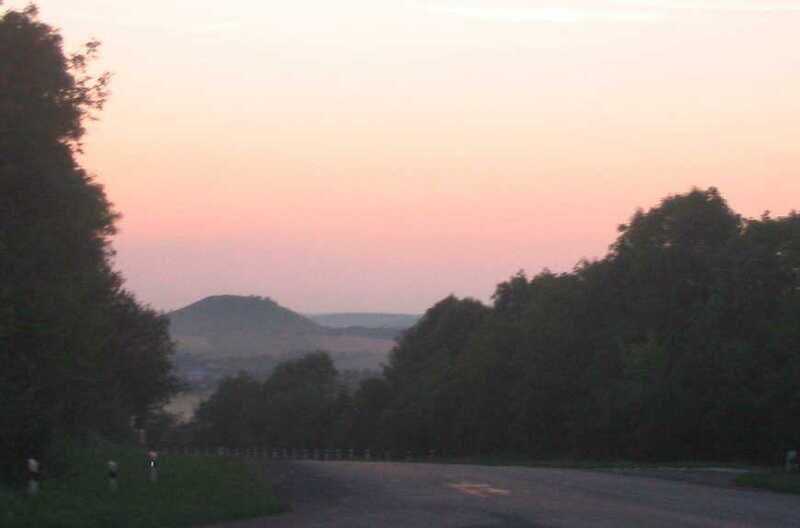 Photo above: Evening view over Devil's Mountain by Rohatyn (August, 2004). both were Polish Jesuits. In recently published in Berezhany "Legends of Opillia", there is this legend also, told a bit a different way, as it was a rivalery between Berezhany and Rohatyn towns. 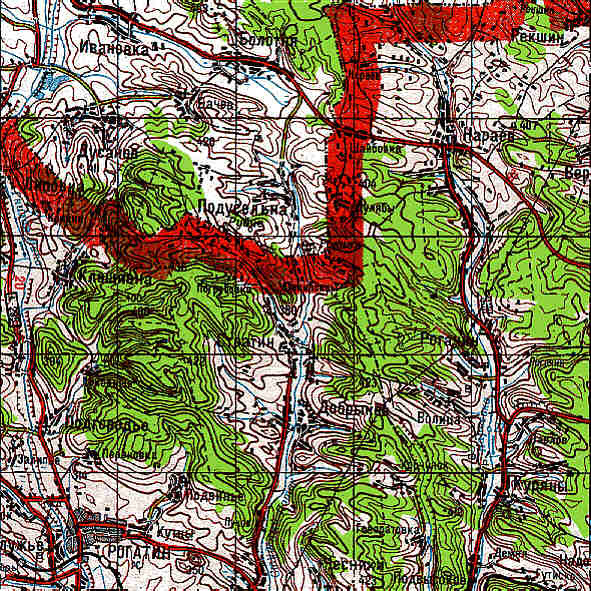 But some 14 km east of Rohatyn (on Rohatyn way just beyond Lopushna, not far from Pidvysoke) there is a huge non-naturally looking valley, form of which quite corresponds to the form of Chortova mountain. known as Galician battle, with 1,5 millions (!!) of soldiers and officers from both sides. wrote them a letter informig about it first. 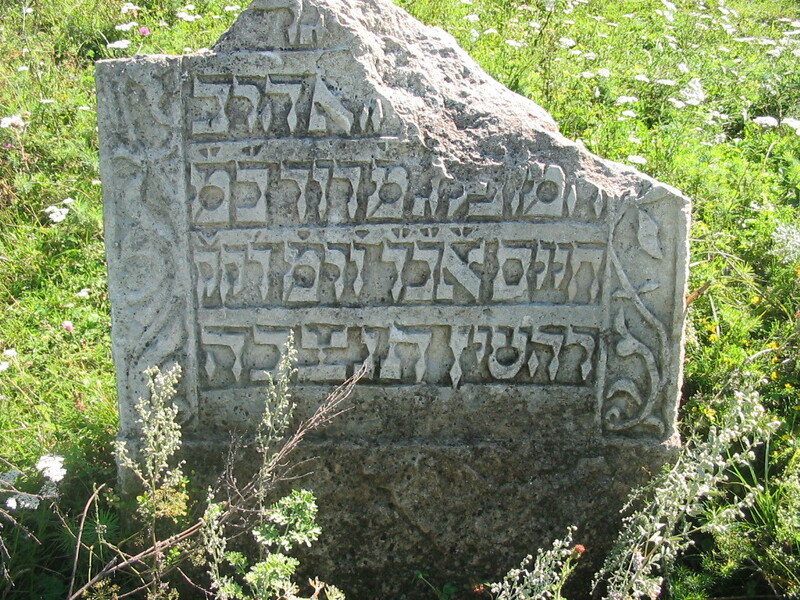 (a few per day), Kolomyya, Yaremcha, Nadvirna, Kalush, Perehinske, Kosiv etc. Western standards) with small hall, three tickets windows. Lypytsya) MLYNYSKA (a forest hamlet actually next my gradparent´s village Pidvysoke. Rohatyn. 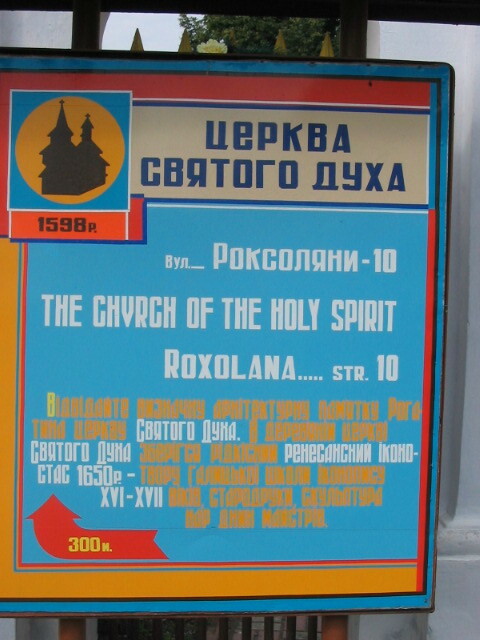 The timetable plaque you will find on the wall at Bus station in Rohatyn. station. To/From Ivano-Frankivsk there is bus almost every hour from/to Rohatyn. Open Joint Stock Company "Khlibodar" (Rohatyn Grain Processing Combinate). and around which town is built mainly. Telephone code for Rohatyn is 03435 (mind 0 in front) if you call within Ukraine. And 380-3435 (which besides city code without zero, includes also Ukraine's international prefix 380) if you call from abroad. (where I studied, doing ytwo years MPhil in Medieval Studies). Updated on 09.08.2013 in Reykjavik Iceland. or languages or Eastern European Jewish history abroad. Please contact me, if you have any suggestions.